My first first reaction to this statement is that technology is absolutely a force for equity in society. There are so many positive ways in which we can use technology to promote equity as well equality in society. As Daniel mention in the zoom chat, technology can be a great equalizer. The problem lies within how the technology is being utilized and the ways in which people choose to use it. This week the debaters were Jen, Dawn, and Sapna vs. Amy S. and Rakan. I wanted to try something new for my reflection this week! 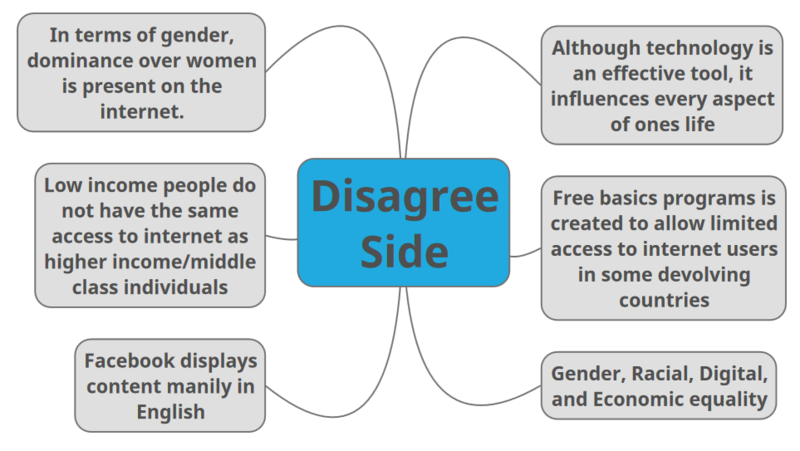 I decided that I would create TWO mind maps of the key points that stuck out the most both on the agree and disagree side. The agree side made some wonderful arguments about how technology can be an equalizer is society. I think one of the ones that stuck out most was the fact the technology can connect everyone in the world in many ways. This provides some great opportunities for positive environment. I also appreciate the fact that technology can accommodate everyone no matter who they are, especially because I am a teacher. There are so many needs in my own classroom, that technology gives those students will challenges an opportunity to receive the equal opportunity. Next, comes the disagree side. This statement was definitely a touch one to argue! The following are the main points I gathered from both Amy S. and Rakan. Although I more so side with the agree side, the point they made that technology has the potential to negatively influence many aspects of ones life is quite frightening to me. I guess you never know how one will react to things posted online. Another point they made was the fact that “Low income people do not have the same access to internet as higher income/middle class individuals“. In saying that, this then cause unequal opportunity for low income individuals to search and apply for jobs online. Overall, I still believe that technology can be an equalizer in society. 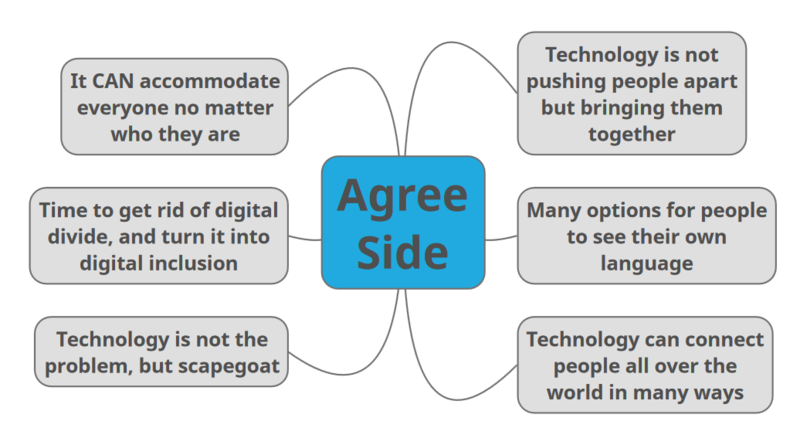 The ways in which we choose to use technology, educate our children about technology as well, promote technology is very important when determining if it will be successful! I really like the way you summarized the agree/disagree points with mind maps! Great idea! I agree that the way you summarized both sides of the debate was a great visual. I wasn’t sure what this topic really meant at first, so I was pleasantly surprised to hear both sides show the information in such an informative way. This debate really got me thinking about my own thoughts on how technology can in some ways create equality but also there were good examples of how it is also a reflection on the issues we have in society today.